Plus: All the winners for the awards. 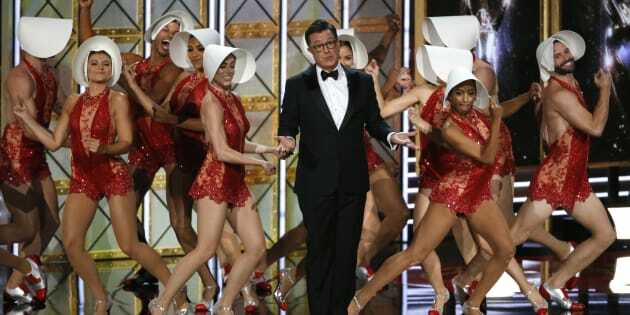 LOS ANGELES — "Saturday Night Live" was triumphing early at Sunday's Emmy Awards for a season of skewering President Donald Trump, while the ceremony and host Stephen Colbert did likewise. The trophies for best supporting comedy acting went to Kate McKinnon, who played Hillary Clinton on "SNL," and Alec Baldwin for his Trump portrayal on the NBC show. McKinnon thanked Clinton for her "grace and grit" Baldwin spoke directly to Trump, who has complained in the past he was cheated out of a trophy for hosting "Celebrity Apprentice": "Here's your Emmy," Baldwin said. Melissa McCarthy was honoured at last weekend's creative arts Emmys as best guest actress for her "SNL" work, including portraying Sean Spicer. The former White House press secretary made a surprise Emmys appearance, wheeling in his own podium. Outstanding Supporting Actor In A Drama Series: John Lithgow, "The Crown"
Outstanding Supporting Actress In A Limited Series Or TV Movie: Laura Dern, "Big Little Lies"
Outstanding Directing For A Comedy Series: Donald Glove, "Atlanta" — "B.A.N." Outstanding Writers For A Drama Series: Bruce Miller, "The Handmaid's Tale" — "Offred"
Outstanding Supporting Actor In A Comedy Series: Alec Baldwin, "Saturday Night Live"
Outstanding Directing For A Limited Series, Movie Or Dramatic Special: Jean-Marc Vallée, "Big Little Lies"
Outstanding Supporting Actress In A Limited Series Or TV Movie: Alexander Skarsgard, "Big Little Lies"
Outstanding Supporting Actress In A Drama Series: Ann Dowd, "The Handmaid's Tale"
Outstanding Writing For A Comedy Series: Aziz Ansari and Lena Waithe, "Master of None" — "Thanksgiving"
Outstanding Reality Competition Series: "The Voice"
Outstanding Directing For A Drama Series: Reed Morano, "The Handmaid's Tale" — "Offred"
Outstanding Writing For In A Limited Series Or TV Movie: Charlie Brooker, "Black Mirror" — "San Junipero"
Outstanding Director For A Variety Series: Don Roy King, "Saturday Night Live"
Outstanding Variety Talk Series: "Last Week Tonight With Jon Oliver"
Outstanding Lead Actor In A Comedy Series: Donald Glover, "Atlanta"
Outstanding Lead Actor In A Limited Series Or TV Movie: Riz Ahmed, "The Night Of"
Outstanding Lead Actress In A Limited Series Or TV Movie: Nicole Kidman, "Big Little Lies"
Outstanding Television Movie: "Black Mirror" — "San Junipero"
Outstanding Lead Actor In A Drama Series: Sterling K. Brown, "This Is Us"
Outstanding Lead Actress In A Drama Series: Elisabeth Moss, "The Handmaid's Tale"
John Lithgow, who received the best supporting drama actor for his role as British leader Winston Churchill in "The Crown," took a more diplomatic approach to political commentary. In these crazy times, [Winston Churchill's] life, even as an old man, reminds us what courage and leadership in government really looks like. Alexander Skarsgard and Laura Dern were named best supporting actors in a limited series or movie for "Big Little Lies." Before the show started, "This Is Us'' stars Sterling K. Brown and Ron Cephas Jones were among the Emmy Awards nominees playing it cool as they arrived. The actors paused for photographs and interviews on the red carpet, which for the first time was tented and air conditioned to provide relief from the usually warm September weather in Los Angeles. Nature provided a break as well, with temperatures in the 70s. Brown won an Emmy last year for playing O.J. Simpson prosecutor Christopher Darden in the limited series "People v O.J. Simpson: American Crime Story," and this time is up for best drama actor for the NBC drama. "It does feel different but for different reasons. I'm the first African-American in 16 years nominated. That kind of blows my mind," he said. Andre Braugher, who was the last black actor to get a nod in the category, for "Gideon's Crossing" in 2001, also was the last one to claim top drama performance honours, for "Homicide: Life on the Street" in 1998. Another "This Is Us" star, Chris Sullivan, made a fashion statement with a top hat, cane and purple bow tie. He wasn't alone in going for a bold look — Jeremy Maguire from "Modern Family" vamped in a purple cape — while Tessa Thompson and Issa Rae dazzled with sophisticated, brightly colored gowns. Jackie Hoffman, nominated for the FX series "Feud: Bette and Joan" said she's "less freak-out nervous" now that all the pre-Emmy festivities are over and she's finally at the big show. The honours themselves could make a statement. In the drama category, the nominees include polar opposites "This Is Us," a heartfelt family drama, and the dystopian "The Handmaid's Tale," which some observers have called a reflection of our time. A victory by NBC's "This Is Us," the first network drama series to be nominated since CBS' "The Good Wife" in 2011, would prove that broadcasters can compete with the more adventurous premium cable and streaming platforms that target niche audiences. No network series has won in the category since "24" in 2006. In the drama category, the nominees include polar opposites "This Is Us," a heartfelt family drama, and the dystopian "The Handmaid's Tale." With previous two-time winner "Game of Thrones" absent because it fell outside the eligibility window, "This Is Us" and "The Handmaid's Tale" are among an unprecedented number of newcomers that include "The Crown," "Stranger Things" and "Westworld." Repeat contenders "Better Call Saul" and "House of Cards" round out the field. Among comedy nominees, the political satire "Veep" is a favoured again after two consecutive wins, and its star Julia Louis-Dreyfus is considered equally if not more likely to claim the best comedy actress trophy for the sixth time for her role. Combined with Emmys she's won for "Seinfeld" and "New Adventures of Old Christine," that would tie her with Cloris Leachman as the most-winning Emmy performer ever. "Veep" is competing with "Atlanta"; "black-ish,"; "Master of None"; "Silicon Valley"; "Unbreakable Kimmy Schmidt" and "Modern Family," which, with five previous wins in the category, is tied with "Frasier" for most top-series awards ever. It could be a big night for African-American performers. There are a record 12 black actors competing for lead or supporting honours in continuing comedy and drama series, including "Atlanta" creator and star Donald Glover. But no Latinos and only one Asian-American — "Master of None" star and co-creator Aziz Ansari — were nominated.